Remember ROSS from TV “Friends”? 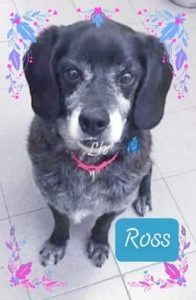 David Schwimmer isn’t at Last Hope but ROSS the Beagle/Cocker is. Our ROSS is an outgoing, mature, frosty face fellow originally a stray at Brookhaven Town Shelter. He’s looking to be a Man’s, Lady’s or Family’s Best Furry Friend..